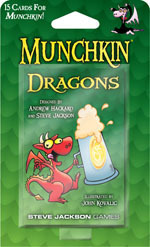 Daily Illuminator: Grab Your Munchkin Dragons Before They're Gone! September 22, 2015: Grab Your Munchkin Dragons Before They're Gone! Despite the fact that they were just reprinted, we are already running low on the Munchkin Dragons booster. If you've been wanting it, be sure to grab it now!